NASA's NuSTAR probe is designed to take pictures of faraway X-ray phenomena, such as blasts from black holes, but the satellite turned its camera toward the sun to snap a picture that's dressed up in colors suited to the holidays. The readings from NuSTAR (which is short for Nuclear Spectroscopic Telescope Array) were overlaid on an ultraviolet image of the sun's full disk from NASA's Solar Dynamics Observatory to produce what scientists say is our parent star's most sensitive X-ray portrait. The picture released Monday follows through on a suggestion that solar scientists made about seven years ago, well before NuSTAR's launch in 2012. "At first I thought the whole idea was crazy," Caltech's Fiona Harrison, the principal investigator for the NuSTAR mission, said in a NASA news release. "Why would we have the most sensitive high-energy X-ray telescope ever built, designed to peer deep into the universe, look at something in our own backyard?" 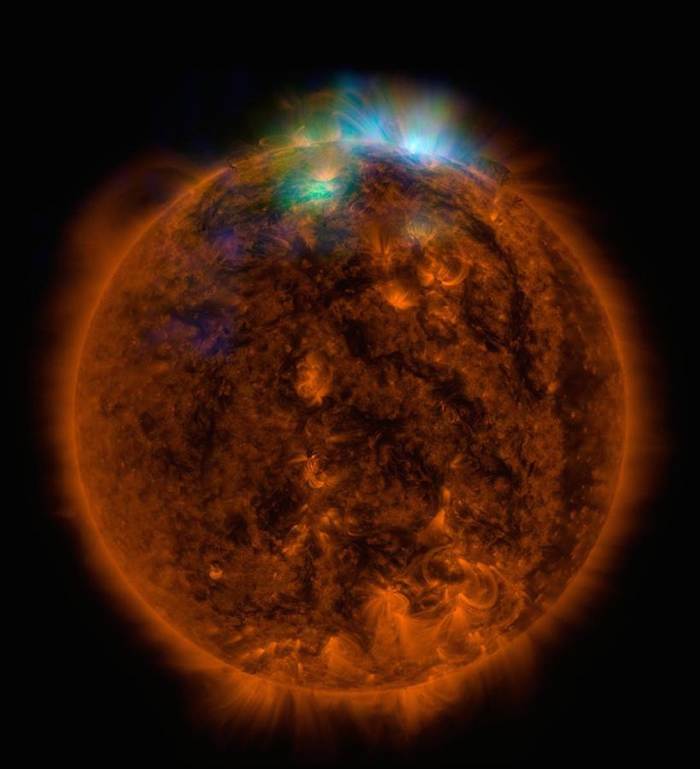 But David Smith, a solar physicist and a member of the NuSTAR team at University of California at Santa Cruz, told Harrison that theorists predicted the sun should be giving off faint X-ray flashes — outbursts that could be detected only by NuSTAR. With Smith's help, Harrison saw the light. NuSTAR saw the light as well. 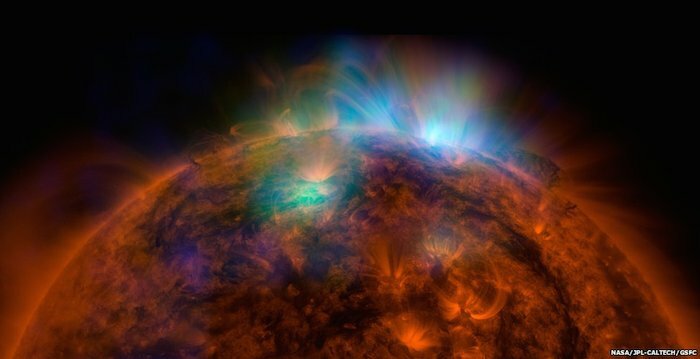 The NuSTAR readings along the edge of the sun, shown in green and blue, reveal high-energy X-ray emissions from gas that's been heated to more than 3 million degrees Celsius (5.4 million degrees Fahrenheit). The reddish disk represents the Solar Dynamic Observatory's ultraviolet view of lower-temperature material (1 million degrees C, or 1.8 million degrees F).